Practical legal guidance to help clients navigate business transactions. Calfee’s team of more than 25 dedicated mergers and acquisitions attorneys provide practical legal guidance to clients to assist them in navigating through a purchase, sale or other business transaction. With a strong foothold in the regional middle market, we represent both privately held and publicly traded companies, private equity funds, family owned businesses, and private entrepreneurs, among other types of clients. Calfee handles transactions of all sizes – with completed transactions ranging in value from $500,000 to more than $3 billion. We know how to staff transactions and use resources in a cost-effective manner and how to add value with our competitive rates. Whether a deal involves a relatively straightforward asset purchase of a single facility business, or a multi-entity, multi-jurisdictional transaction for a publicly held conglomerate, we have the necessary experience to get it done. We understand that each transaction is unique. We have the resources to staff each deal with appropriate attorneys from other practice groups who have experience in areas such as Securities and Capital Markets, Tax, Commercial Business, Intellectual Property, Labor and Employment, Real Estate, Environmental and Antitrust, to name just a few. Collaboration with these team members ensures that each transaction is efficiently managed, while adequately covering the myriad issues raised by any transaction. Our M&A attorneys focus on understanding the business motivations underlying each transaction. We help our clients identify the best transaction structure, devise strategies to mitigate risk and overcome obstacles, and negotiate reasonable protections in light of the size and complexity of the deal. 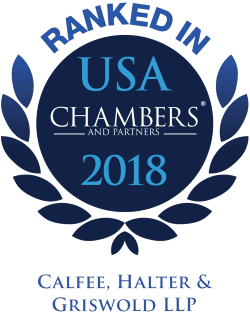 Calfee has been selected for inclusion in the 2018 Chambers USA "Leading Lawyers" for Corporate/M&A. According to a recent edition of Chambers USA, Calfee’s M&A practice group is recognized for being an "Impressive team with a strong track record across a broad range of corporate and transactional matters, acting on behalf of public and private businesses and financial institutions. Areas of excellence include M&A, securities offerings and private equity and venture capital fund formation." Calfee was ranked in the IFLR1000 United States Guide to USA's Leading Financial & Corporate Law Firms "Elite Dealmakers" 2018 in the areas of Corporate and M&A and Capital Markets. "They are excellent. I would recommend them. They have been an impressive law firm to work with." Represented a buyout fund in the purchase of a wide range of platform and add-on businesses, generally ranging in value from $20 million - $150 million. Represented the majority owners of a food manufacturing and distribution company in the redemption of minority interests for over $250 million. Represented an insulation installation company in the acquisition of numerous regional installation businesses for between $3 million - $140 million. Represented a publicly held manufacturing company in the acquisition of multiple businesses for purchase prices of $10 million - $100 million. Represented a chemical company in the acquisition of various other chemical businesses for prices ranging from $10 – $50 million. Represented the owners of a steel fabrication company in the sale of a majority of its equity to a platform company of a buyout fund for $4 million. Represented the owners of a gas distribution company in the sale of a majority of its equity to a buyout fund for approximately $20 million. Represented a consumer products company controlled by a buyout fund in multiple add-on acquisitions ranging from $15 million - $25 million. Represented a family held wire manufacturing and distribution business in a sale to its senior management for approximately $20 million. Represented a newly formed buyout fund in the acquisition of multiple platform and add-on businesses ranging in value from $20 million – $50 million. Represented a software company in the sale of its equity to a platform company of a buyout fund for $4 million. Represented a publicly held food and beverage manufacturing company in the purchase and sale of various business units for values ranging from $10 million – $3.3 billion. Represented a family-owned manufacturing business in the acquisition of an operating division of a large publicly held company for approximately $90 million. Represented an insurance advisory and brokerage firm in an ESOP transaction that resulted in a 100% employee-owned business. Our M&A attorneys guide clients through the process of structuring, documenting, negotiating and closing acquisitions and sales of assets and stock, mergers, strategic alliances, and joint ventures. After closing, we advise clients on post-transaction integration matters. In the case of acquisitions, after a closing we often function as outside “general counsel” to the acquired business on day-to-day legal matters. We work with our clients to negotiate a reasonable allocation between the transaction parties of liabilities and risks. We help our clients to make practical decisions that further their business goals. We also counsel our clients on potential tax savings or deferral opportunities in structuring transactions. Know the client and never lose sight of the client's objectives. Be creative in identifying solutions that enhance the client's success. Be responsive and communicate with the client regularly. Give proactive, practical advice to enable the client to make informed business decisions. Trust and respect the client in order to foster a strong, long-term relationship. Many of our M&A attorneys have previously served as in-house counsel, corporate board members, or advisory board members for companies. This collective experience has shaped our M&A attorneys’ perspective and provided valuable insight into the mindset of our clients. Our M&A attorneys approach engagements with a sense of teamwork – working together internally across multiple disciplines and working closely with our clients’ management and other internal and external advisors – to efficiently coordinate transactions and achieve optimal outcomes. Whether guidance is needed in environmental, employment, intellectual property, real estate, employee benefits, data security, tax planning and compliance, or any other legal area, we bring to the table the necessary expertise.